PROBE Canada is an ethics and boundaries course specifically designed to meet the unique needs of Canadian healthcare professionals. 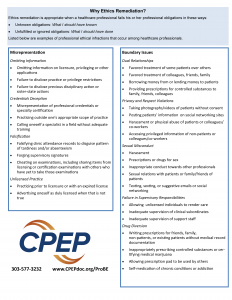 Like its US counterpart, PROBE Canada (Professional, Problem-Based Ethics) is a non-adversarial ethics and boundaries program for all healthcare professionals – not just physicians. This course is designed to fulfill regulatory college or credentialing requirements for remedial education. To date, participants have come from seven Canadian provinces and have included dental professionals, pharmacists, physiotherapists, physicians, trainees and others. 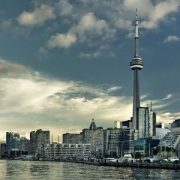 Where is PROBE Canada offered? 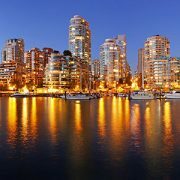 The PROBE Canada program is offered in Toronto, ON, and Vancouver, BC at different times throughout the year. In the U.S., PROBE is offered in Denver, CO, Raleigh, NC, and Newark, NJ. Please Click Here for a complete list of available sessions. A list of upcoming courses is at the bottom of this page. There will be 9 PROBE Canada sessions offered in 2019. Please Click Here for a complete list of available sessions. A list of upcoming courses is at the bottom of this page. PROBE is open to all healthcare professionals and trainees. This includes physicians, nurses, pharmacists, dentists and dental assistants, physical therapists, chiropractors, medical students, residents and others. Every session is multi-disciplinary and are never restricted to one specialty or degree. (303) 577 – 3232 or email info@cpepdoc.org. US and Canadian PROBE Program participants who earned either an unconditionally or conditionally passing grade qualify for PROBE Plus. While participants who failed the PROBE Program do not automatically qualify, they may qualify if they repeat the PROBE Program and earn an unconditionally or conditionally passing grade the second time. The fee for PROBE Plus is $2,500 US. 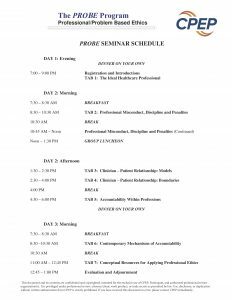 Enrolling in PROBE Plus is easy, but is done separately from the PROBE seminar registration. 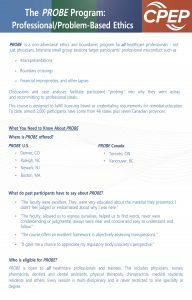 To learn more about registering for PROBE Plus, please call 303-577-3232 and speak with one of our education professionals.